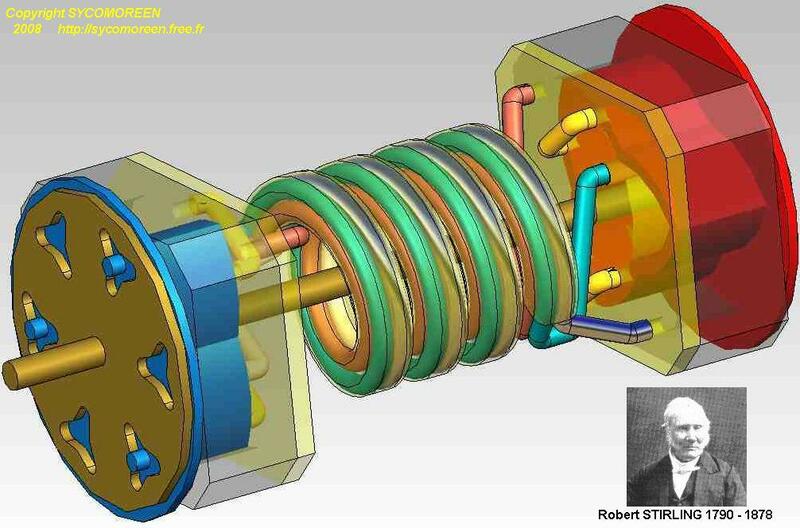 The invention is about a device (1) built with rotary annular trilobic piston engines, thanks to the bi-level with inegal volumes characteristics that they offer in their generic version ; one peripheral cover (CAR), one bi-arched core (NBA) one rotary annular trilobic piston (PRA) which turns and slides between the core (NBA) and the cover(CAR), as described in the demands PCT 03.3921, and INPI 07.5990 et 07.6157 set down by Pascal HA PHAM. 1. The maximum and minimum volumes of the Stirling cycle are simply obtained by the volume of the rooms ot the external level which is bigger than the one of the internal level. the coolant fluid inside one machine(2,2F,2C), at an homogeneous temperature. 3. The isochoric times of the cycle are perfectly respected by connecting rooms of same nature and motion between the hot machines (2C) and the cold machines (2F). 4. One or several regenerator(RGN), placed between the machines(2,2F,2C), thanks to opposed and unidirectional fluxes of coolant fluid, bring an excellent internal recycling of heat between the isochoric cooling and heating of the Stirling's cycle. - or resulting of an artificial cooling. The invention will integrate particulary well on « Hyperthermal fall of direct solar radiance (PHRSD) » designed by the company SYCOMOREEN (France) to develop solar electricity. The size of the devices(1), which are Stirling engines with rotary annular trilobic piston (SPRATL) can be very variable, starting from a few score of centimeters for a domestic use to finish to a few score of meters for industrial plants. - specific applications, for example the thermal energy of the seas, or the nuclear-powered ships where the cogénération and the absence of explosion in the machines of Stirling are appreciated. 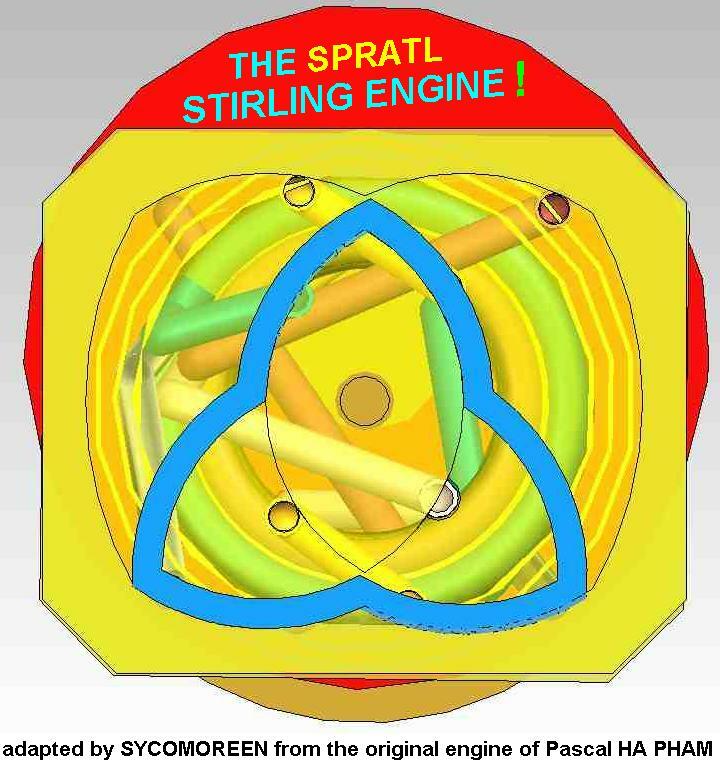 - « SPRATL engine » will designate the Stirling engine with rotary annular trilobic piston in conformity with the invention (1). Numerous precisions will be brought in the following desciption, chronologically treating the themes : thermodynamic cycles of Stirling, state and limits of the present art, proposed solutions (recall of the features of the PRATL machines, clearing on their exploitation in cycle of Stirling, stake in series and parallel of several PRATL machines, conversion of the motion, precautions of thermal insulation, principle and advantages of the regenerator, stemming of the rooms, extension to rotary annular polylobic pistons), measurements and applications of the present invention. SPRATL Machines in Symphony sent by Sycomoreen.